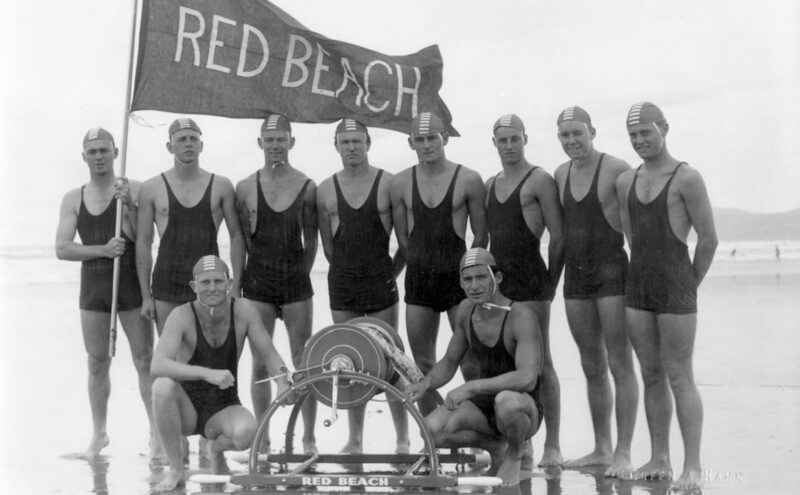 The formation of the Red Beach Surf Club came about through a drowning at nearby Orewa Beach. In the summer of 1953, Toby Mitchell, on holiday in Pinewoods Motor Camp at Red Beach, witnessed the fatality from his bach on a hilltop overlooking the Orewa estuary. He felt that if surf lifesavers had been on hand at Red Beach they might have been able to reach the drowning person with less difficulty than the rescuers experienced. He discussed his ideas on the formation of a club at Red Beach with Peter Bevin, a New Zealand champion lifesaver, and then with Allan Gardner, the chairman of the Auckland Surf Life Saving Association. Mitchell, along with Red Beach residents and holidaymakers interested in safety at their beach, banded together to progress the idea of establishing a surf club. During Easter of 1953 they invited officials of the Auckland Surf Life Saving Association to meet with them and discuss forming a club. On Sunday 31st May 1953, the officials were again invited to attend a meeting of Red Beach residents on the community green in Pinewoods Motor Park – this time to add another name to the list of Auckland surf clubs. Mitchell was elected as the club’s first president. Allan Gardner spoke at the two inaugural meetings and explained what assistance the club could obtain from the association. Those present were informed that, as an affiliated club, it would be given surf reels and caps but would have to provide the rest of the equipment and its headquarters on the beachfront. With a membership of around 25, the new club’s teams trained through the winter of 1953 to become qualified lifeguards for the following summer. The Red Beach Surf Club, following its formation on 31st May 1953, set out on a sandy pathway to grow its membership and establish its headquarters. By October 1953 a constitution had been drawn up and, as read by Hugh Watt MP, was adopted. Hugh Watt had a holiday bach in the adjacent Pinewoods Motor Camp. By April 1954, negotiations were under way with the local authorities to obtain a section for the purpose of erecting a clubhouse. Fundraising was under way from the word go. Some of the more novel fundraising efforts in those early days included the employment of club members as ushers for the Boxing Association's open air bouts at Carlaw Park at 30 shillings ($1.50) per head. More orthodox raffles, dances and concerts, along with donations and fees, helped swell the funds. The year 1956 saw several important milestones for the club. The Owen Chapman Cup was donated and a competition and rules were formulated. The Owen Chapman Cup surf carnival has since grown to become one of the most popular events on today’s competition circuit. Plans for the clubhouse were approved, and a site suitable to local residents was pegged out by the Commissioner of Crown Lands. The club became incorporated and, after due negotiations, the building permit was issued in December 1956. 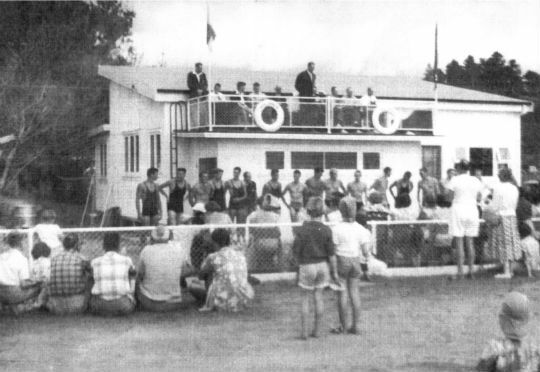 The demise of the Waitemata Surf Club at Oneroa Beach on Waiheke Island in 1957 heralded a boost to the fledgling Red Beach club. Among the new members it gained were Reg Harker, Fred Dennerly, Doug Ellis, Paul Ranby, Allan Anderson and Roy Woodall. At this time, the only facility at Red Beach was a shed which served as storage for the club’s gear. Slow progress on the building of the clubhouse was due to lack of money and construction came to a standstill. Following a period of nothing happening, there was a re-injection of interest in getting the clubhouse completed. It was officially opened by Norman King MP during Easter 1959. The original headquarters were demolished in December 1982, just as the club was moving into its current premises and readying for a March 1983 opening by Prime Minister Rob Muldoon. on the land which is now the Red Beach waterfront reserve.